The Whitley Fund for Nature (WFN) is holding a special East Africa event where powerful talks will be given by two of Kenya’s conservation heroes, prominent pollinator expert Dr Dino Martins and anti-poaching activist Dr Paula Kahumbu. Taking place at the Royal Geographical Society in London, the evening will be hosted by the highly-acclaimed natural history filmmaker, Alastair Fothergill, Executive Producer of BBC’s The Hunt in 2015, and will discuss the challenges of conservation work in East Africa. Dino Martins is one of Africa’s most influential entomologists and was recognised with the coveted Whitley Gold Award in 2015. He campaigns for the insect pollinators that are vital to improve farm yields in Africa and deliver food security. Dino is active on the world stage whilst also working with local farmers and schoolchildren to raise awareness of the key role that these small creatures play in our lives. Tackling illegal pesticide use and working with government and businesses to address threats to insects, and therefore to food production, is all in a day’s work. The farmers who Dino works with are gradually adopting more sustainable farming practices that conserve pollinators, boost yields and improve livelihoods. They have also lobbied government to successfully secure a ban in Kenya on several highly toxic pesticides, improving chances for the country’s bees and farmers. One of every three bites of food we eat is dependent on pollinators. These tiny insects – the bees, wasps, butterflies, moths, flies and beetles – play a critical role in crop pollination. The provision of this free ‘ecosystem service’ is worth an estimated $250 billion annually to the global economy. Without pollinators, the planet’s food security would be at risk, with significant livelihood ramifications; and billions would need to be spent to pollinate crops artificially. However, the increased use of agricultural pesticides and loss of natural habitats has led pollinator numbers to decline dramatically. As a result of winning a Whitley Gold Award, the increased international profile has helped Dino reach and influence international decision-makers with his compelling message about safeguarding pollinators to deliver food security. He presented a keynote speech at the 2016 ‘Ecosystem Services for Poverty Alleviation’ meeting at the World Agroforestry Centre, Nairobi and also delivered a persuasive Trondheim Lecture on Biodiversity, hosted by the Norwegian Government with the United Nations Development Programme (UNDP) and the World Bank amongst others. Discovered a new species of bee in Turkana which nests underground and has no stripes: Samba turkana – named in honour of the region, its peoples and biodiversity. With the support of the United Nations Food and Agriculture Organisation (FAO) and local universities, Dino developed the first agro-ecology syllabus for East Africa to embed pollinator conservation in agriculture training. Contributed to the International Biodiversity & Ecosystem Services Panel which produced the ground-breaking 2016 global assessment of pollination services. This will inform decision-makers of the vital contribution of pollinators to delivering global food supplies. Sensitized over 2,000 local farmers to the message “no pollinators=no food” using a simple experiment: by protecting one flower in a bag, leaving another open to insects and watching to see how the crop develops, the farmers build an understanding of the fundamental role of insects in crop development that is life-changing. These farmers are now actively managing their farms to help conserve pollinators including the planting of hedgerows, and many have seen crop yields increase by up to ten fold. A network of farmer groups and women’s groups have engaged a further 5,000 farmers who are now aware of the impacts of pollinators on farm yields and the negative effects of pesticides. Dino has also expanded his pollinator educational work to include new crops such as: passionfruit, French beans, watermelon, and commercially important canola, sunflower and coffee grown adjacent to critical forests. Became a best-selling author – his 2015 book, ‘Insects of East Africa’ has sold out in under a year and is being reprinted. 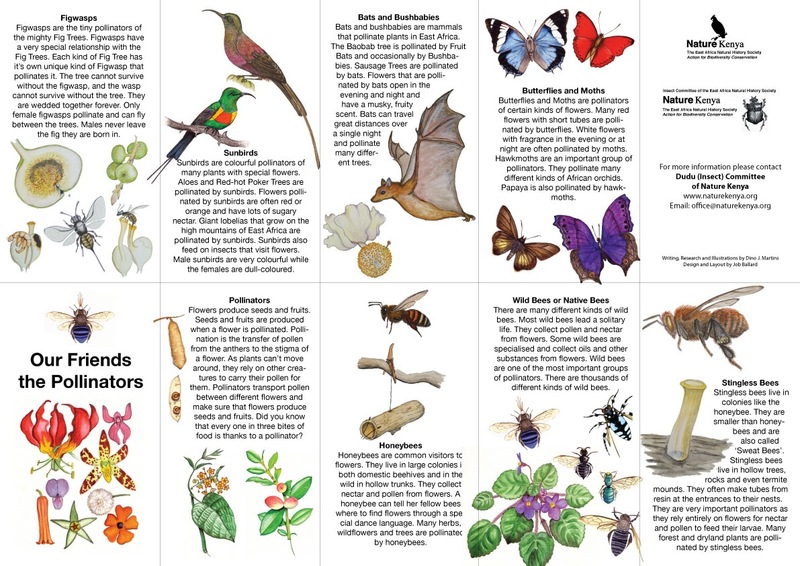 In 2016 he completed ‘Butterflies of East Africa’ and updated ‘Our Friends the Pollinators’ alongside his free pollinator guide – to raise awareness of insect biodiversity more broadly. Reached over 100,000 people through an article in the Kenya Airways in-flight magazine ‘Msafiri’ and provided information to over 150,000 small farmers through Kenya’s innovative iCow app. Dino won his initial Whitley Award in 2009, before going on to receive additional WFN funding in 2011and being recognized with the Whitley Gold Award in 2015 – WFN’s top profile and PR prize. Tickets for the evening event will be released late September and will be available on a first-come, first-served basis. Talk tickets: £35 (including drinks reception); Talk & Dinner: we will be suggesting a voluntary donation of £250 per person (places are limited). For more information see here. The Whitley Fund for Nature (WFN) is a UK registered charity that champions outstanding grassroots leaders in nature conservation across the developing world. It provides Whitley Awards – often referred to as “Green Oscars” – to individuals in recognition of their achievements in nature conservation. Each Award Winner receives £35,000 in project funding over one year. Since 2001, the charity’s patron HRH The Princess Royal has presented the Awards at an annual ceremony in London. Whitley Award winners join an international network of Whitley Award alumni eligible to apply for the Whitley-Segré Conservation Fund. These follow-on grants are awarded competitively to winners seeking to scale up their effective conservation work over 1 to 3 years. The Whitley Gold Award recognises an outstanding past recipient of a Whitley Award who has gone on to make a significant contribution to conservation. Over the last 23 years, WFN has given £12 million to conservation and recognised more than 170 conservation leaders in over 70 countries. The Whitley Awards are open to individuals working on wildlife conservation issues in developing countries. Applications are now open for the 2017 Awards; further information on eligibility criteria is available from Firebird PR and our website. WFN is generously supported by: Arcus Foundation; The William Brake Charitable Trust; The Byford Trust; Sarah Chenevix-Trench; The Constance Travis Charitable Trust; Garden House School Parents’ Association; Garfield Weston Foundation; The G D Charitable Trust; HDH Wills 1965 Charitable Trust; HSBC Holdings Plc; Icon Films; Interconnect IT; Lund Trust: a charitable fund of Peter Baldwin and Lisbet Rausing; Montesogno; Notting Hill Preparatory School; The Rufford Foundation; The Schroder Foundation; Fondation Segré; The Shears Foundation; Steppes Travel; The Whitley Animal Protection Trust; WWF-UK; The Friends and Scottish Friends of the Whitley Fund for Nature; and many individual and anonymous donors.